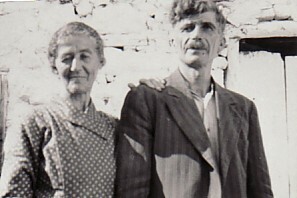 Above: My parents, Konstantinos and Ralouda. 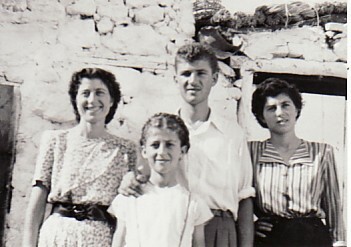 Above Right: With my sisters, Eleni, Amalia and Maria. Above: Celebrating Easter with friends. Standing from left are: Giorgos Simeon, Nikolaos Makrodoulis, Efstratios Alvanos, myself, Giorgos, Paraschos Koutellis and Christos Lafazanis. 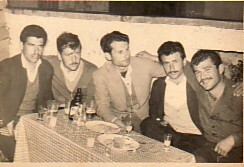 Sitting from left are: Christos Petridis, Efstratios Menemenios, Andonios Fanaras, Efstratios Foulas, Stavros Lafavanis and Efstratios Kekvas. 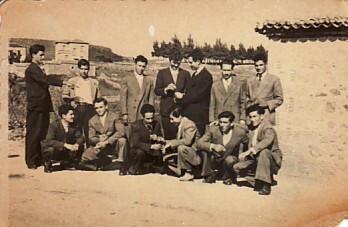 Above Right: As a waiter at the panygiri of Agia Paraskevi. 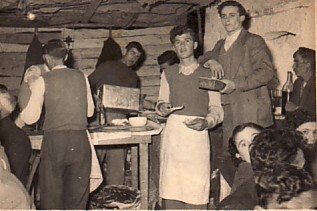 I am wearing the apron, and next to me is Efstratios Menemenios, while my father, Konstantinos, can be seen on the right of the photograph. In the back is Chrystoforos Mihailiris "Kinta". Above: At the panygiri of Agios Haralambos. 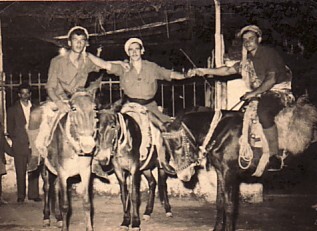 From left, we are: myself, Nikolaos Kazantzis and Efstratios Menemenios. 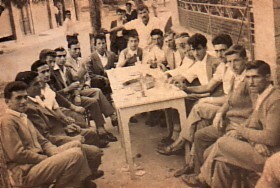 Above Right: As a waiter at Mario Baziniotis' Kafeneio and serving a large group of villagers. Above: Friends. From left, we are: Giorgos Voudouris, Anastasios Halvatzis, Marios Baniziotis, Giorgos Simeon and myself. 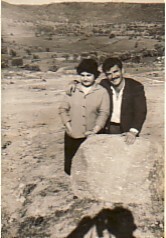 Above Right: With my fiance, Maria Zaharopoulou.